GM stays silent over changes at top | What Car? This week's sudden ousting of General Motor's (GM) boss, Fritz Henderson, forced a last-minute substitute to give the opening address at the Los Angeles motor show. 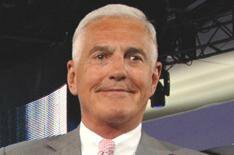 GM's sales and marketing chief, Bob Lutz, stood in for his former chief executive, who was fired a few days ago. Henderson had been scheduled to give the keynote speech to the media. A hastily pasted patch on the billboard outside the hall where the speech took place, replacing Henderson's name with that of Lutz, illustrated the sudden and unexpected nature of the changes at the top of GM. It is believed Henderson was ousted because of policy disagreements with other GM executives, particularly in relation to the sale of its European offshoots. GM has since decided to keep two of them, Vauxhall and Opel, after Henderson had already negotiated a sale. He said a slimmed-down GM now has 'a better foundation for success than anyone could have imagined this time last year'. The GM stand at the 2008 LA motor show was unmanned.